Navigation along the north west coast had long been known to be hazardous (it is one of the most dangerous coastlines in the world) and consideration was therefore given to the establishment of lighthouses along the coast. A Board of Enquiry was established in 1907 and the masters of a large number of coastal vessels were queried as to their opinion on the best sites for lighthouses. Four sites were chosen at Pt Cloates, Fraser Island, Cape Inscription and Cape Leveque, and a decision to build in the following two years was made. With the lighthouse building program well under way, the state was ill prepared for the wrecking of the Mildura off North West Cape in 1907. The site, Vlaming Head, had been proposed by a number of masters at the Board of Enquiry but had failed to achieve majority support. The marine Board of Enquiry into the Mildura disaster recommended on July 8, 1907 that a fifth new light should be erected on the NW Coast so that Vlaming Head should be lighted as well as Pt.Cloates. The Harbour and Lights Department announced in 1909 that they were to build the lighthouse at Vlaming Head. It was determined that the height of the tower to the floor of the lantern was to be twenty feet and to be built out of locally available stone. A year later due to lack of Commonwealth funds the lighthouse project was no further advanced and the State was forced to take steps to build the lighthouse itself. Vlaming Head is physically very isolated and difficult to reach by sea. The nearest port was some two hundred miles away and the closest beach for landing supplies was over three miles from the proposed site. Provision of fresh water for the labourers, and the lighthouse keepers, was a major obstacle that needed to be overcome, and which shadows the whole history of the lighthouse. Supplies during construction were shipped from Fremantle, sent to Ashburton by steamer, then back to North West Cape by schooner, where they were landed on the beach. To solve the problem of getting supplies from the beach to the Lighthouse a small tramway was built, this was horse drawn by a Clydesdale named 'Captain'. A jetty was not possible owing to rough seas. Water for the labourers was provided by a salt water condenser, but the water quality was not good. In his report on the state of lighthouses Commander Brewis reported that illness due to dysentery had considerably delayed construction. The only death occurring during construction was that of Mr F J Reddy who died of dysentery after a seven day illness (Mr Reddy's grave can be seen today marked with a white cross near the Lighthouse Caravan Park). Large underground tanks were built for the lighthouse keepers and their families, drawing on the artesian water in the area, but the condenser remained in the event of an emergency. The lighthouse was eventually completed in 1912, and the light's first use was on the 10 December of that year. Fresh meat for the lighthouse keepers was supplied by Mr Payne of Yardie Creek Station. Other food essentials, such as fresh milk were provided by the small herd of goats kept by the lighthouse keeper's wives, and by fishing. Watches were kept throughout the night, starting between 4 and 6 pm and finishing as late as 8 am. Additional work on the light had to be carried out in the remaining eight hours, leaving the men very little contact with their families. The long awaited handover of lighthouses to the Commonwealth took place in 1917 and the full title of Lyndon Location 22 was transferred to the Commonwealth in April, 1949. During the Second World War the North West Cape became a very valuable refuelling depot for US Navy ships and the Airforce developed at Learmonth. A Radar post was developed near the lighthouse. In 1953 a cyclone damaged both facilities considerably. The lighthouse and quarters did not fare lightly either with extensive damage to the lighthouse keepers quarters. Over the next year the keepers themselves did much of the repair work. The Radar Tower had deteriorated to such an extent that it could not be restored therefore a replica structure was constructed and installed on site in February 2001. The Lighthouse operated from the Vlaming Head site for over 60 years but in 1969 a light was mounted on tower 11 at the US Naval Communications VLF site at Point Murat. To this day this light still flashes a warning to seafarers to "beware of the treacherous coastline of the North West Cape". The lighthouse keepers' quarters have been transferred to private ownership and have now been developed as part of the Lighthouse Caravan Park. The Lighthouse is a rendered concrete base structure with a steel-domed prefabricated lighthouse lantern on top. The walls are of shuttered stone with a mortar infill. They are shuttered with rough timber the width required. Some mortar is mixed and dropped into the shuttering followed by a layer of capstones up to 300 mm2. Rocks and mortar were then placed all the way around and walling built up layer by layer. The sedimentary capstone was used as this was a hard and locally obtained rock. The exterior and interior of the lighthouse and the quarters were then rendered or plastered. The lens prisms are hand ground and are arranged so that the light exhibited from the filament is collected and refracted through the lens so as to converge at a central point on the horizon. The lens turntable floats in a bath of mercury and is rotated by a system of gears which are motivated by a predetermined weight situation in a column running up the centre of the tower. The light source is derived by heating kerosene in what are known as vapour tubes and then sprayed as a vapour into the mantle. It was the lighthouse keeper's duty to keep the pressure tanks for the kerosene at a constant pressure and periodically wind the lens weight to the top of the weight tube. Due to considerable damage to the Lighthouse from Cyclone Vance in 1999, in late 2000 and early 2001 a considerable amount of restoration works were carried out to the lighthouse and adjoining storage shed. 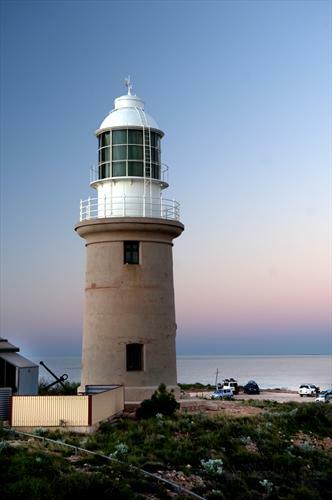 Currently the Vlaming Head Lighthouse is not open for tours, however you can still enjoy the magnificent views from the hill which is a popular spot to watch the sunset, passing humpback whales or for a scenic view of the Ningaloo Reef.